The arrest of Huawei CFO Meng Wanzhou is a dangerous move by US President Donald Trump’s administration in its intensifying conflict with China. If, as Mark Twain said, history often rhymes, our era increasingly recalls the period preceding 1914. As with Europe’s great powers back then, the United States, led by an administration intent on asserting America’s dominance over China, is pushing the world toward disaster. The US rarely arrests senior businesspeople, US or foreign, for alleged crimes committed by their companies. Corporate managers are usually arrested for their alleged personal crimes (such as embezzlement, bribery, or violence) rather than their company’s alleged malfeasance. Yes, corporate managers should be held to account for their company’s malfeasance, up to and including criminal charges; but to start this practice with a leading Chinese businessperson is a stunning provocation to the Chinese government, business community, and public. Meng is charged with violating US sanctions on Iran. Yet consider her arrest in the context of the large number of companies that have violated US sanctions against Iran and other countries. In 2011, for example, JP Morgan Chase paid $88.3 million in fines in 2011 for violating US sanctions against Cuba, Iran, and Sudan. Yet Jamie Dimon wasn’t grabbed off a plane and whisked into custody. None of the CEOs or CFOs of these sanction-busting banks was arrested and taken into custody for these violations. In all of these cases, the corporation was held accountable. Nor were they held accountable for the pervasive lawbreaking in the lead-up to or aftermath of the 2008 financial crisis, for which the banks paid a staggering $243 billion in fines, according to a recent tally. In light of this record, Meng’s arrest is a shocking break with practice. Huawei is one of China’s most important technology companies, and therefore a prime target in Trump administration’s effort to slow or stop China’s advance into several high-technology sectors. America’s motivations in this economic war are partly commercial -- to protect and favor laggard US companies -- and partly geopolitical. The US is trying to target Huawei especially because of the company’s success in marketing cutting-edge 5G technologies globally. The US claims the company poses a specific security risk through hidden surveillance capabilities in its hardware and software. Yet the US government has provided no evidence for this claim. Sanctions regarding non-national parties (such as US sanctions on a Chinese business) should not be enforced by one country alone, but according to agreements reached within the United Nations Security Council. In that regard, UN Security Council Resolution 2231 calls on all countries to drop sanctions on Iran as part of the 2015 Iran nuclear agreement. Yet the US -- and only the US -- now rejects the Security Council’s role in such matters. The Trump administration, not Huawei or China, is today’s greatest threat to the international rule of law, and therefore to global peace. 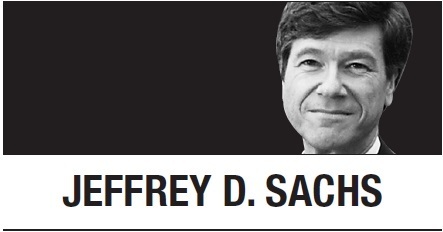 Jeffrey D. Sachs, professor of sustainable development and professor of health policy and management at Columbia University, is the director of Columbia’s Center for Sustainable Development and the UN Sustainable Development Solutions Network. -- Ed.